Lilly Bavay and the Florexotica team located in English Harbour, close to the Marina areas, create truly inspired floral arrangements. Naturally contemporary in her style, Lilly is also able to adapt to her clients preferences and challenges, and can take into account individual styles, cultures and wishes. Florexotica sources only the freshest flowers flown in direct from source worldwide, or from her own 'home grown’ selection of beautiful “tropical flowers’. Viewing visits to the workshop, located just a few minutes out of English Harbour by car, are welcome. You can even create your arrangements in their workshop and get assistance from the floral team. The ever expanding Florexotica team now has a young British designer trained especially in floral events, to further reinforce their ‘European touch” and their range of floral services have expanded to include stylish vases, indoor greenery and unusual decorations to enhance stylish and tropical arrangements. Lilly provides wonderful ‘custom floral service' to yachts. She will visit the yacht for an initial consultation with the head stewardess, view the interior of the yacht so she can get a real ‘feel’ for the colouring/style of the boat, and then – after offering advice or simply listening to each individual clients requirements – she will put together any number of flower arrangements to suit every occasion, style, and individual. In the event that a “specifically personal service” is required, she will even come and put arrangements together for you – on board the yacht. Florexotica's personal service is extended to weddings where Lilly will work with each bride to create the wedding flowers of her dreams. She privdes flowerd for your wedding party, the ceremony and the reception. She can provide brides bouquets, bridesmaids, corsages, grooms, button holes, table arrangements, flowers for the church, ceremony arches or any other requests the party may have. 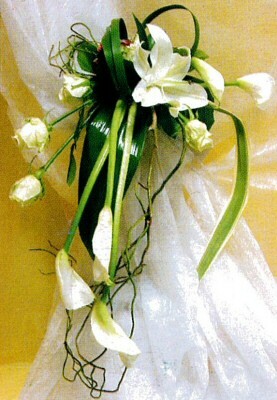 E-mail Lilly your requirements and she will work with you to create wonderful flowers for all occasions. Click here to read about the owners of Florexotica.